This was a fantastic novel that deftly balanced humor, existential depression and a real sense of how families work. The Lamberts are a family undone. Enid and Al, the mother and father, live in the town of St. Jude, located somewhere in the American Midwest-wasteland. Their children have left them and moved to bigger cities, becoming a fund manager, a high-class chef and a college professor. From the outside, one would think the two generations have little in common; when allowed access to the interior monologues and home lives, though, we see that the apples barely even bounced off the tree as they fell. Enid’s one fervent wish is to have her family home for Christmas, but who knows what’ll be left of each of the family members as the holiday rolls around. As I said before, this book is masterfully done. Coming from the DeLillo-Pynchon postmodern school, this takes tropes like paranoia and searching for identity in the modern world and throws them into a setting that isn’t as alienating as is the norm. 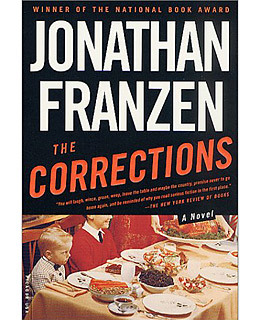 Jonathan Franzen melds the postmodern to a post-familial state, as each of the Lambert family members has very good reasons to get the hell out of St. Jude, and maybe only one possible reason to stay. I loved how each family member (in addition to Enid and Al, there’s sons Gary and Chip, and daughter Denise) shares very similar internal dialogues with anxiety and mental illness, but framed differently based on their own histories and points of view. Where Gary sees his brain chemicals as being like stocks traded in the marketplace, Denise’s anxiety about various infidelities manifests itself as the texture and flavours she works with every day writ large, as tongues that take the place of every surface. Here’s what Time‘s Lacayo had to say about it: http://www.time.com/time/specials/packages/article/0,28804,1951793_1951939_1952267,00.html. I’d like to say more about the book, but I feel I’d ruin its pleasures by not letting you experience them on your own. Total pages read since January 1st: 6002 pp.